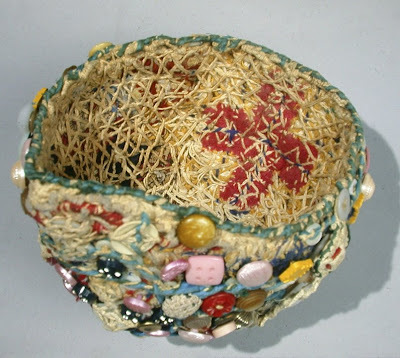 (Above) Charlie Logan’s beaded hat (turned upside down) which is very similar to an African Kuba hat. Notice the red cross on the back inside wall. 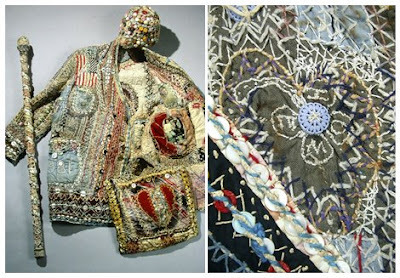 (Above left) The “Diamond Sis” coat—and a detail of the intricate sewing, embroidery and obsessive patterning. 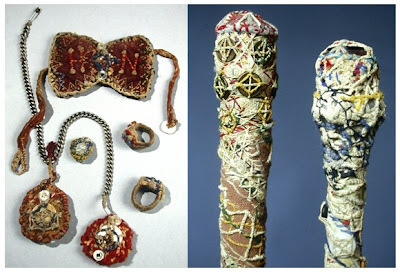 (Above left) Charlie’s bow-tie with the letters “H” and “N,” which, according to Charlie, stood for “Heaven.” Also, rings and a watch fob, which did not hold a watch but various charm-like items. (Above right) Close up view of two of Charlie’s many canes. 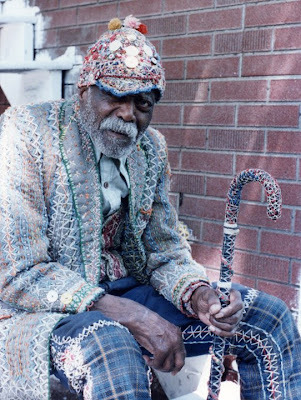 (Above) Photograph of Charlie Logan, near his home in Alton, IL in 1979. All photographs © by Kate and Ken Anderson. At that time, the ENVISION publication (Vol. 9, Issue 1, January 2004) was published on a shoestring budget and consequently, in black and white. When I discovered (just last night) the original scans of these rare images in COLOR, I realized that I had to get them out for people to see. 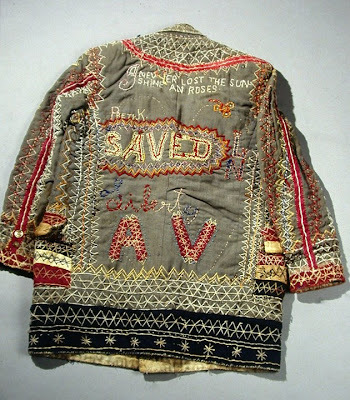 The entire set of clothes (28 pieces in all) were acquired by the Philadelphia Museum of Art, where they are today. Wow. Those are amazing. I may have to go to Philadelphia now. Incredible! How could this man be from Alton and I have never heard of him? Thank you for sharing.